How to repair the "Hogshead"
The Model T Ford Transmission cover, or "Hogshead" as it is more commonly referred to (at least in the USA) can require a number of small repairs that are often overlooked. The most common is oil leaking from the pedal shafts as they enter the transmission cover, but the following article covers repairing slack between the transmission pedal and the shaft that it rotates. This slack if left unchecked slowly becomes worse making adjustment of the transmission bands more difficult. Why are donations needed? Read why here. 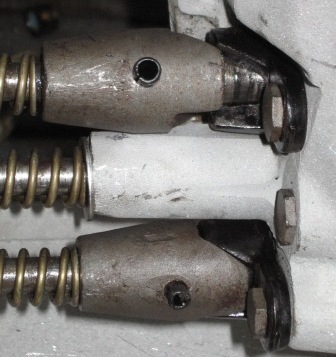 One of the common wear points in the Model T "Hogshead" occurs when the original hot riveted pins that locate the transmission pedals on the shafts loosen. As the pins loosen, a small amount of movement is allowed between the pedal and the actual shaft it rotates. Over time, this continual movement slowly "flogs" out the hole either in the pedal, the shaft, or both. As this "flogging" of the holes continues, the movement increases and exacerbates the wearing of the holes even further. Sometimes, this can be resolved easily if caught early and the rivet head or tail can be further peened over. However, as even the youngest of Model T Fords is now over 80 years old, it is likely that the wear has progressed too far. In this example, as you can see in the photo of the original rivets, the movement in this case has resulted in a slight bending of the rivet as well. In this Hogshead, or Transmission cover, theses pins had been "tightened" in place with a chemical locking agent that eventually failed. There are a couple of approaches that can be taken to permanently repair this problem. The first option, and obviously ideal if you're a "purist" is to drive out the old worn rivets and if possible, replace them with new rivets which must be heated to cherry red and then hot riveted in place. Sounds easy doesn't it? Well in reality, not every Model T Ford enthusiast has the tools, experience and extra hands to safely and effectively complete this process. Henry Ford had employees experienced in this process (as it was a common practice in the day) who completed it thousands of times a week. It is important that the rivet maintain an appropriate heat level whilst being fitted and then riveted tight. Not an easy task without the original Model T Ford factory tools. Why not consider the second option as shown here. It provides an easier and equally effective method of repairing the problem. This is done by replacing the rivets with hardenened steel roll pins. The pins are readily available in a large number of sizes and lengths and make it much easier to compensate for wear in either the pedal or the shaft. 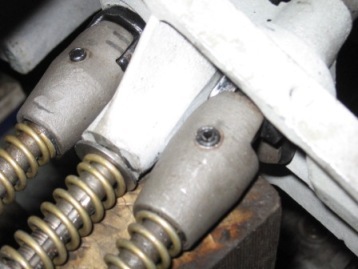 The pins are not Model T Ford specific and should be easily obtained from any automotive or fixings supplier. In the following example, once the main pins are fitted, a second is set inside to further strengthen the repair. 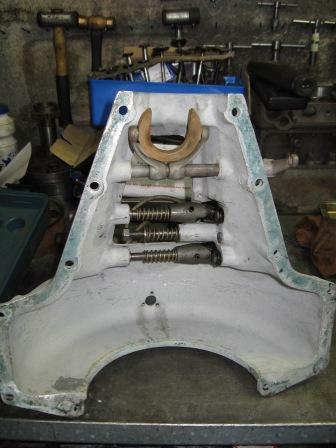 Assuming your rivets are loose already, support the pedal shaft from beneath with a suitable block of wood or similar. Using an appropriately sized drift and hammer, drive the old rivet out of its hole, from the tail end. It may be necessary if the end of the rivet has been heavily peened over, to gently and carefully grind the end of the rivet off to ensure it can be driven backwards out the shaft hole. Once removed, inspect the hole in both the pedal and shaft, checking for fatigue cracks and burrs. If cracks are found, the faulty component must be replaced. Burrs should be removed with an appropriately sized die grinder or file. It is likely that the roll pins you find will be too long and some amount of material with extend either end. If this is the case, the pins will need to be trimmed with a grinder. Measure the size of the shaft hole, this will be the maximum size diameter pin you can use. If the holes in the pedal exceed this too much, you will unable to get a tight fixing of the two components together. I would expect only in the worst of cases that this would be the case. Again, with the pedal shaft supported, the new pin can be driven in with a drift and hammer. If available, a second person woudl be of great help to ensure that the transmission cover is held steady to prevent movement. As you can see in the photo, the pin is not a solid tube, but is slit down the side. This allows for a small amount of compression as the pin if fitted. This compression needs to be taken into account when selecting the appropriate sized pin. Drive the pin home and check for a tight fit, ensuring it is flush with at least one side. Repeat this process for other loose rivets. Once the initial pins have been driven in, we recommend fitting a second inside. 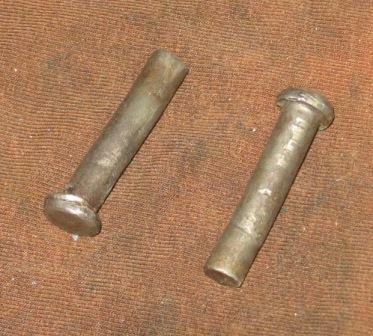 Although the pins are hardened, addding a second will further strengthen the repair. With the second pins inserted, the excess can be trimmed off with a grinder fitted with a fine slitting disc. Make sure you take great care when wielding a grinder in this confined space, both for your own safety and to minimise risk of damage to the cover.